Mark Fierro (Testi) is a pretty top-notch COTE (or Cop On The Edge, as we call them), who is transferred from his normal district of Tampa, Florida to Miami to where all the action is. It seems there is a gang war going on, with drug-related murders galore, and Fierro takes it upon himself, personally, to stop it. Of course, his partner Hoagy O’Toole (Nummi) - who is not an overweight Bond girl - is along for the ride as well. Of course, Fierro finds time for romance with an attorney named Lori (Cavalli) while he fights his way to the main mob boss, Tony Romeo (Guerrini), but he also has to try to repair his relationship with his daughter Paloma (Bellini). In the midst of all the warring factions, will Mark Fierro emerge as the...FIRST ACTION HERO? Of all the contemporary titles to cash in on, it seems sort of odd for someone to pick the classic (?) Arnie vehicle Last Action Hero (1993), especially since this is a sort of latter-day Poliziotteschi and Austin O’Brien is nowhere in sight. 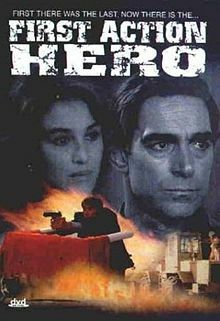 We’re huge fans of Fabio Testi - his The Heroin Busters (1977) alone puts him in the action movie firmament forever - but, let’s face it, he’s not the first action hero. That’s clearly Jesus. Or maybe Imhotep. We’re not sure how far back “first” really entails. The original title, Il Burattinaio, translates from the Italian as something like “The Puppetmaster”. Why couldn’t they have left it at that? But, quibbling about the title aside, if you love those great Italian crime films of the 70’s but always wished you could see one set in Florida and everyone wears 90’s-style high-waisted pants, your dream has come true. We get some funny dubbing, some great, breezy music on the soundtrack (by director Grassia with Aldo Tamborelli), and classic characters like Spuds and Hoagy. Hoagy, of course, not to be confused with Hogie from Detention (2003) and the classic, anguished cry of “HOOOAaaaaggyyyyyy!!! !” The TV show Miami Vice went off the air in 1990, and Miami Beach Cops came out in 1992, so the world was prepared for the Miami-set action of First Action Hero in 1994. It was pretty common for Italian filmmakers to come to the U.S. and shoot their films there, however. There are some baddies that show up at funerals and hospitals and shoot people with machine guns. That’s considerate of them, at least their respective victims are in the right place. Sometimes these masked shooters even wear “X” baseball caps, further reinforcing the 90’s vibe. But overall it was great to see a then-53-year-old Testi blowing away the bad guys like nobody’s business, mouthing off to his superiors, speeding around Miami, and even letting sticks of dynamite show his enemies his own brand of justice. Even into the 90’s, he was an awesome dude with an attitude. Speaking of which, it all comes to a bang-up climax which is very, very enjoyable to watch. Sure, there are some slow moments throughout the 100-minute-plus running time as Testi puts on his detective hat and tries getting answers from people the old-fashioned way - not to mention the drama entailed by his relationship with his daughter, his partner, and his girlfriend - but all that’s to be expected and we really had no problem with it. Especially when that jaunty song comes on, followed quickly by a scene of mindless shooting. If you’ve seen every Poliziotteschi movie out there and are still craving for more, First Action Hero, while certainly not perfect, probably shouldn’t be last on your list. Is this the one with lots of action taking place in a construction site with gravel, dumpsters, rebar etc? If so then good call! Lots of fun, bad guys falling off roofs and so on. Construction eh, dangerous business ! Love the 90s vibe. 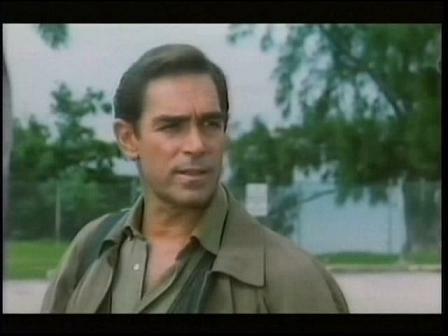 It's a dangerous business when Fabio Testi is in the action, that's for sure!